Pallatrax pop-up hookbaits have been designed to complement our bait range. These floating baits are super buoyant allowing the angler to give a hookbait presentation off the bottom and, therefore, clear of weed and debris. 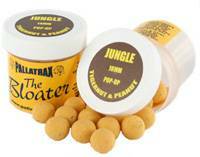 Pallatrax pop-up hookbaits have boosted levels of flavours and enhancers to give heightened attraction.